The Canadian Red Cross says it has spent millions providing 95,000 Haitians with safe shelter, including thousands who have received toilets and earthquake-resistant homes, as the U.S. Red Cross faces criticism following a report documenting its lacklustre relief assistance in the country. The Canadian Red Cross is making an effort to assure Canadians that the funds they donated to Haiti earthquake relief were spent on helping those who need it most, following a report that half a billion dollars raised by the U.S. Red Cross to build housing had achieved little in the way of home construction. "Canadians can be confident in their trust of the Canadian Red Cross," Nathan Huculak, a spokesman for the organization told CBC News. More than five years after a 7.0 magnitude earthquake killed thousands amid widespread devastation, the organization says $190 million out of the $222 million donated by Canadians has been spent on humanitarian assistance. "The majority of our projects have completed," Huculak said, adding the remainder of those funds are earmarked for future projects in the Caribbean country. The Canadian Red Cross says 2.5 per cent of funds contribute to overhead costs, but Huculak said all donations are filtered into segregated accounts to assure money doesn't suddenly disappear. 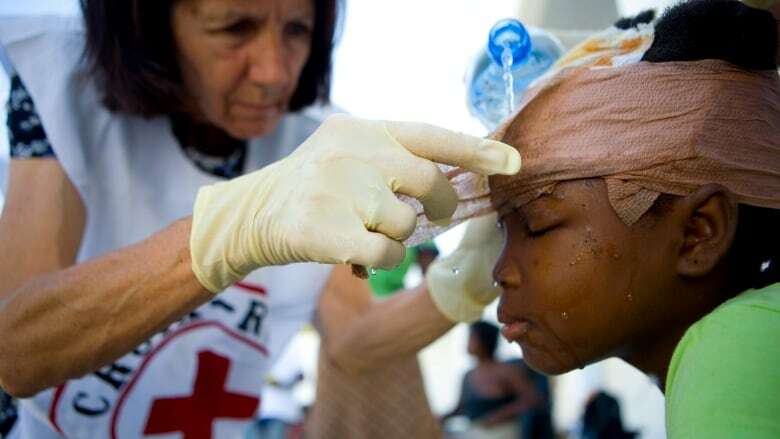 The reassurances follow a damning report on the progress of the American Red Cross's humanitarian assistance efforts in Haiti by Justin Elliott of ProPublica, a New York-based non-profit investigative group, and Laura Sullivan of National Public Radio (NPR) in the U.S. The American Red Cross raised $500 million US with the promise to build tens of thousands of homes in Haiti but only managed to build six homes, Elliott told CBC's As It Happens this week. Promises of permanent housing and brand-new communities have yet to come to fruition. The Canadian Red Cross funds, with assistance from the Canadian government's donation matching, have been carefully spent, the organization says. "We're incredibly transparent and responsible," Huculak said, pointing to strong ratings and auditing reviews from publications such as MoneySense. In total, 19,000 families, approximately 95,000 people, have been provided with safe shelter by funding from Canadian donors. That includes 7,500 permanent homes that meet standards to withstand hurricanes and earthquakes. The funding also provided Haitians with latrines, or toilets, aimed at improving sanitation, and transitional shelters. More than 2,000 families received cash grants for rent or assistance moving. The organization also said it is building a hospital in conjunction with the Canadian government, the American Red Cross and some institutions in Quebec. Canadians can examine the Canadian Red Cross's 2015 donor report for full details on how Haitians were assisted and money was spent.